New Day = ‘New’ Mass | Nan Tubre Writes . . .
Today the Roman Catholic Church begins using what has commonly been referred to as the ‘new’ Mass. In reality, there is nothing new about it. It is the same Mass as ever – the same celebration of praise, worship, repentance and sacrifice that has been celebrated for centuries. At the center is Jesus Christ, our Beloved. His mighty love for mankind is what brought us, our forefathers, and will bring future generations to the Table. He is the Bread of life, our strength, our hope. The only change in the Mass, is the wording we will use from now on in certain responses we give. In other words, when our priest says “peace be with you”, instead of saying “also with you”, we will respond with “and with your spirit”. Simple. The changes that have been made are derived from a more literal translation instead of modern day english. Personally, I’m very happy with it. Having to put thought into what phrase I respond with makes me feel more involved. When someone says “Peace be with you”, I really mean “and with your spirit” when I say it. It comes from the heart. It makes perfect sense, really, beacause we are all merely embodied spirits anyway. Right? We are not our bodies. They are our tempory bodies. They pass away; we do not. 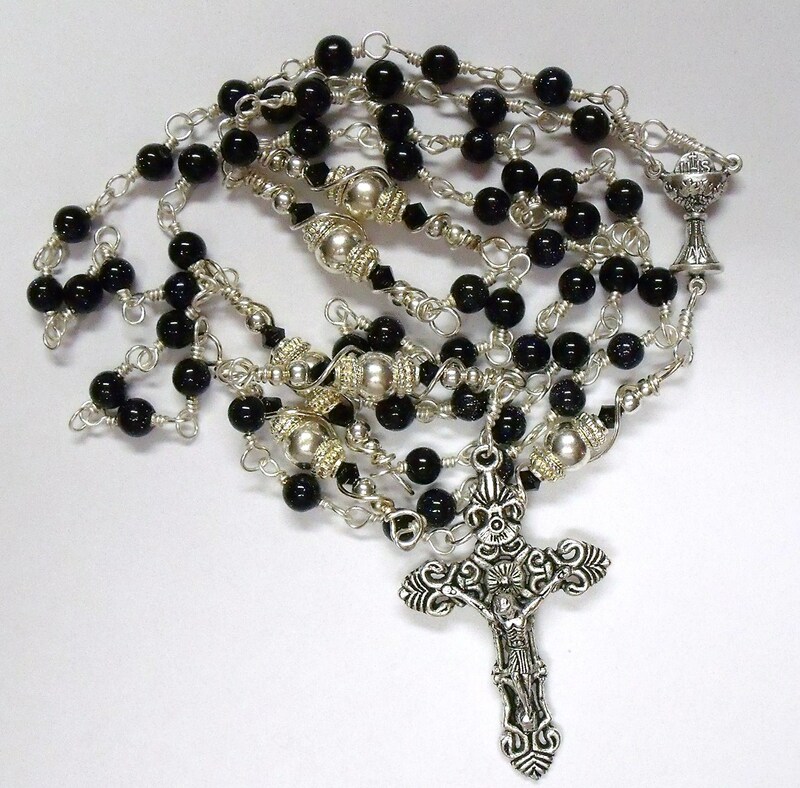 This is one of my favorite rosaries I’ve made thus far. The goldstone beads are simply gorgeous and shine with silver flecks that look like stars. Silver plated 8mm balls flanked by the same finish bead caps and silver balls as well as black 4mm bicone crystals, all hand wire wrapped in silver plated wire. It is for sale: $32 + 2.51 shipping. Soon, I will post another of my favorites: my Christmas rosary!